Large spacious renovated farmhouse situated in the Charente, SW France ideally suited for large families/groups. The property can accommodate up to 11 people and stands in grounds of 3 1/2 acres. Beautiful farmhouse with pool, totally refurbished to offer guests a comfortable holiday in the wonderful Charente region of France.Very reasonably priced for large families or groups to share. Beautiful gite with above ground pool, refurbished to offer guests a comfortable holiday in the wonderful Charente region of France.Very reasonably priced for large families or groups to share. Adult only property in a great location for a relaxing holiday. 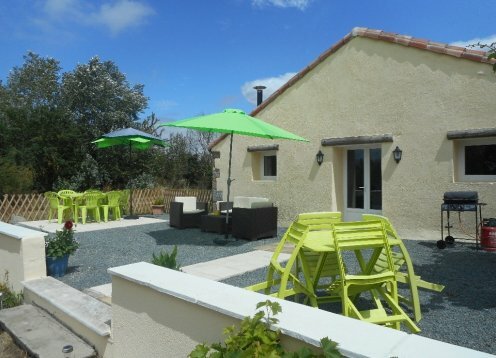 Our lovely detached gite has a large heated pool and terrace,fabulous views and all amenities nearby. There is everything you need for a completely stress free holiday with no children around! Delightful renovated 2 bed cottage with private terrace & shared pool. 2 bed cottage in the stunning Charente countryside. Beautifully converted detatched barn In peaceful and stunning location with private pool and far reaching views across the countryside. With 5 Bedroom, 3 Bathroom, 2 En-suite and large garden.